Nepal hasn’t spent any of the $4 billion of foreign earthquake aid. $4 Billion of Foreign Earthquake Aid Was Pledged to Nepal. None of It Has Been Spent Yet. 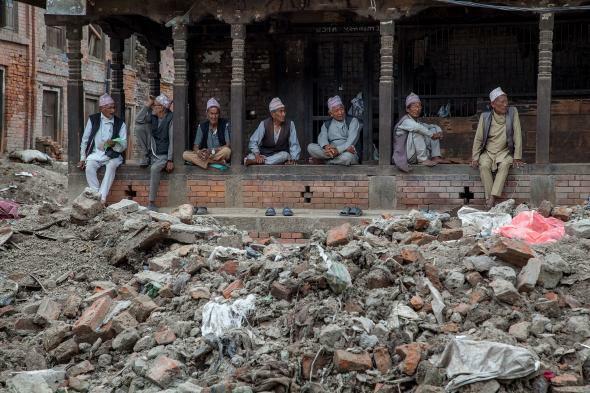 A group of elderly men chat near a pile of debris on July 29, 2015 in Bhaktapur, Nepal. Two devastating earthquakes shook Nepal four months ago, claiming almost 9,000 lives and scrambling the lives of millions more—toppling homes, destroying livelihoods, and displacing families. Administering aid in the immediate aftermath of the quakes was difficult enough as Nepal’s government struggled to cope; international aid agencies and foreign governments promised more than $4 billion in assistance. Now, four months after the natural disaster, Nepal has not only failed to spend any of that money on reconstruction, it hasn’t made arrangements to receive the funds, Reuters reports. Pokharel said the government had failed to spend any money because ministers had still not signed off on rebuilding and aid distribution plans. He said the government made an error by attempting to pass a contentious constitution that will create a new political system and divide the country into new regions, a decision that has led to deadly clashes. The government argues the overhaul will help reconstruction in the long run by creating greater stability. In the meantime, tens of thousands are living in makeshift tents in Kathmandu and beyond and, according to the U.N., 10 percent of the country’s population is still in need of shelter, food, and medical treatment.